In 1950s England, an unconventional young woman develops her reputation as a bold journalist while cherishing—and sometimes forfeiting—a profound female friendship. Prizewinning British novelist Quinn (Curtain Call, 2015, etc.) opens his epic-length saga of Freya Wyley’s life on VE-Day, May 1945, in the riotous streets of London as crowds celebrate the end of World War II. Freya, who served in the Women’s Royal Naval Services, meets and gets very drunk with unsophisticated Nancy Holdaway, an aspiring writer with a place at Oxford University, like Freya herself. Thus begins a story of female connection, professional ambition, and romantic questing set against a backdrop of England’s social and political postwar shifts. At Oxford, Freya mixes with a colorful group—like flamboyant, foppish actor-wannabe Nat Fane and secretive but handsome Alex McAndrew. Later, in London, where Freya and Nancy share an apartment, some of these figures recur and other semirecognizable ones join the circle. Is that Lucian Freud over there? Meanwhile the spy drama and sexual scandals in which Freya finds herself involved cleverly echo the actual headline stories of that era. 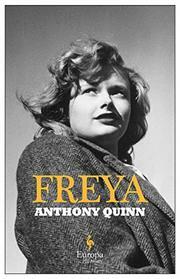 Quinn’s finely detailed portrait of the times creates a rich backdrop for a heroine of debatable qualities: “arrogant, devious, and unprincipled”; “fond of stickin’ [her] fork in other people’s dinners.” But in spite of her vanity and pushiness, Freya is a compelling figure, standing up for her work and opinions and learning, usually from her mistakes, that her relationship with quiet, beautiful, and eventually successful Nancy is the backbone of her life. With its busy plot, its drinking and smoking, its crisp wit and contemporary soundtrack (Peggy Lee, “Winter Weather,” etc. ), Quinn's novel delivers evocative, high-quality entertainment that may well leave readers hoping for a sequel.